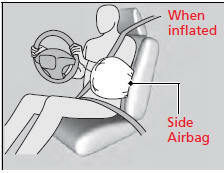 The side airbags help protect the upper torso of the driver or a front passenger during a moderate to severe side impact. 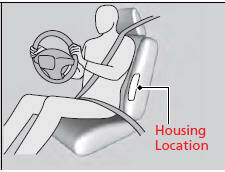 The side airbags are housed in the outside edge of the driver’s and passenger’s seat-backs. When the sensors detect a moderate-tosevere side impact, the control unit signals the side airbag on the impact side to immediately inflate. Make sure you and your front seat passenger always sit upright. Leaning into the path of a side airbag can prevent the airbag from deploying properly and increases your risk of serious injury. Do not attach accessories on or near the side airbags. They can interfere with the proper operation of the airbags, or hurt someone if an airbag inflates. If the impact is on the passenger’s side, the airbag deploys even if there is no passenger’s in the passenger seat. Do not cover or replace the front seat-back covers without consulting a dealer. Improperly replacing or covering front seat-back covers can prevent your side airbags from properly deploying during a side impact. Because the airbag system senses sudden acceleration, a strong impact to the side of the vehicle’s framework can cause a side airbag to deploy. In such cases, there may be little or no damage, but the side impact sensors detected a severe enough impact to deploy the airbag. It is possible for a side airbag to not deploy during an impact that results in apparently severe damage. This can occur when the point of impact was toward the far front or rear of the vehicle, or when the vehicle’s crushable body parts absorbed most of the crash energy. In either case, the side airbag would not have been needed nor provided protection even if it had deployed.